L'originalité n'est donc pas spécialement au rendez-vous. But it's ultimately the characterizations that give the production a paw up on the competition, and the vocal contributions (...). The only plausible origin story I can think of for Show Dogs is that someone forgot to curb their pet, this script dropped out, and someone thought it'd be a fair tax write off that'd have the excuse of the competition being too great. "Show Dogs" is essentially "Miss Congeniality" in the dog show world (...). 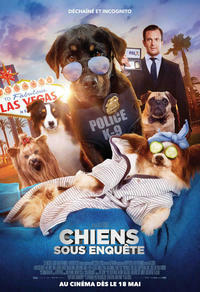 There's a reason talking animal movies often get a bad rap, and this Vegas-set dud is a perfect example.